Pneumatics, hydraulics, and electrical systems all pertain to this “hazardous energy,” and if the sources of that energy aren’t locked down and tagged out, then people could very easily be hurt. The OSHA website gives such examples as “a steam valve is automatically turned on burning workers who are repairing a downstream connection in the piling” or “internal wiring on a piece of factory equipment electrically shorts shocking employee who is repairing the equipment” with regards to hazardous energy. The Tagout portion of Lockout/Tagout is perhaps the most important part. After all, if nobody knows that a machine is shut down, then what’s to prevent its accidental use? “Tagout” refers to the process of identifying a machine as inoperative and labeled as such, with a tag displaying who locked the machine down and when. The Lockout is ensuring that machinery and equipment is shut down, secured, and any sources of hazardous energy are isolated with assigned locks—and that any residual energy is safety restrained or released to prevent unsafe buildup in pressure. Proper Lockout procedure also requires testing the machinery once it has been locked out, to ensure that it can’t accidentally start up again or be activated. Why is lockout/tagout so important? Safety! According to the California Fatality Assessment and Control Evaluation (FACE) program, a mechanic was killed while attempting to repair an escalator. While he was inside a mechanism for the escalator, attempting to repair it, a coworker dropped the machine’s circuit box, turning the escalator on inadvertently. Had the escalator been locked out and tagged correctly, with the electrical disconnect properly secured, then the mechanic’s death would have never happened. Lockout/Tagout saves lives. The OSHA regulation procedures exist to secure equipment and save lives in the workplace. Work sites are a hazardous environment. Help save your own life and the lives of your coworkers with proper OSHA-compliant precautions. Lockout/Tagout your equipment, and make sure those around you are aware of what is and is not safe to use. 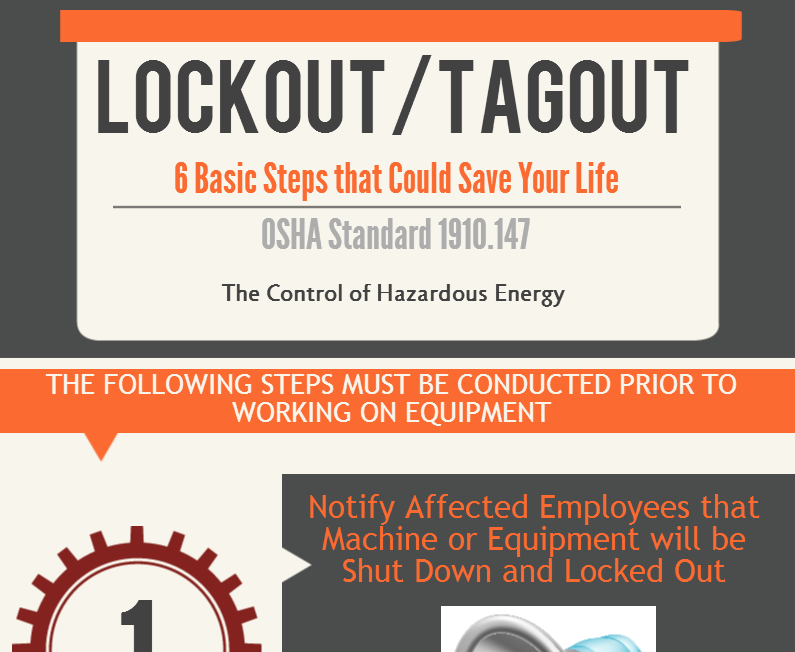 Follow the procedures on our infographic for a step-by-step guide to Lockout/Tagout courtesy of OSHA-Pros.